The sheer number of ski resorts near Geneva airport makes this, almost definitely, the busiest ski airport in the Alps come winter/snow time! Check out some of the ski resorts below using our neat little widget that allows you to choose which country and the amount of time you wish to spend travelling. You can also see our brief guide to Geneva beneath the "Resort by Distances" results. The sheer number of ski resorts near Geneva makes this route to the Alps a first port of call for easy access! Located along the shore of Lake Geneva, the Alps are on the doorstep and dominate the skyline across the lake which you see when coming into land. Geneva really is one of the world's most stunning locations for a City. But what can you expect from this city in terms of it's accommodation for that overnight stay, or it's transport links to the nearby ski resorts for which it's mostly used during the winter months. As well as the gateway to the Alps, Geneva as a city has much to offer tourists. From one of the world's tallest fountains (the Jet d'Eau Fountain) shooting water to 140m, through to the Old Town and the superb museums and art galleries. Of course you can buy everything from watches to diamonds in Geneva, so make sure you bring some cash. With Geneva being home to the United Nations Building and the Red Cross museum, you can take a tour of both then retire to any of the 5 star hotels that litter this city. Complete your stay with a boat ride on the Lake and experience some Swiss cuisine in one of the great restaurants available to you. As nice as all that sounds, you're here for the snow, so whether you're looking for a ski weekend or even a week or two on the slopes, how can Geneva help you? Carrying probably 98 - 99% of all visitors to Geneva, the Geneva Cointrin Airport is usually a dream to negotiate, even at peak periods. It used to be even simpler with the car hire companies offering cars to drive away from the multi story right outside the arrival hall, but it's now moved about 800m up the road. You have so much choice to access Geneva from the UK with everything from BA and Swiss Air through to Easyjet and Jet2 flying - most with multiple flights each day. So what ski resorts are close to Geneva airport to help ensure your children have as little time in the car as possible? Our nifty little gadget above shows you all most of the key ski resorts within 3 hours of Cointrin airport - assuming the road conditions are in your favour and there's no snow chains required! 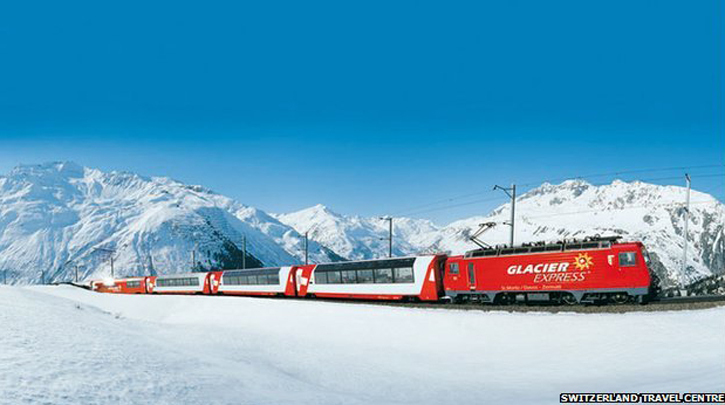 The Swiss ski train leaves from the airport at regular intervals and gives you access through Graubünden and Valais through to Zurich and Basel. Prices if you are a tourist are surprisingly cheap provided you book before you arrive and often children (as part of a family travel free of charge).